Effort is between YOU and YOU! NOW…you have to show that you are a different creature than you were 5 minutes ago…. SO, LET’S DO WHAT WE DO! Being a CFO, one of my many roles is to make the decisions on worldwide real estate for Mozilla. Over the past 3 years, we’ve been very busy opening up 11 Mozilla Spaces (employee and community/contributor work and event spaces) on 4 different continents. As a result, I’m always very close to real estate data streams in various markets and have regular conversations on the topic with a set of my go-to regular experts. One such snapshot came across my email box last week with respect to the San Francisco Commercial Real Estate Market. SF currently happens to be the hottest commercial real estate market in the US right now and arguably in the entire world. (in terms of rental rate increases and vacancy rate decreases). The Rosen Realty Group (RRG) http://www.rosenrg.com/ led by Mark Rosen just published one of their latest installments. Once again, it’s extremely useful and confirmational data for those with eyes/ears close to the ground in the SF Market specifically. A shameless plug is deserved here. I’ve worked with Mark and Anna at RRG for over 10 yrs on numerous deals and consider RRG to be one of the best (OK THE BEST) real estate broker firm for tenants I’ve had the pleasure of working with. Mark and Anna aren’t just “brokers”. Having worked in SF and the Bay Area for the last +25 yrs, they have an amazing network of people and resources to help you get things done. They’ve worked side by side with me and my team to not just do the lease deals (renting the various spaces) but more importantly to monitor and ensure the proper steps to actually get the offices opened (tenant improvements) and to give amazing advice on making these new offices a “home” for those living in it every day. note: I have obtained permission from RRG to republish this copyrighted research report. Barring any economic shocks to the system, there appears to be more room to continue the recent trends. 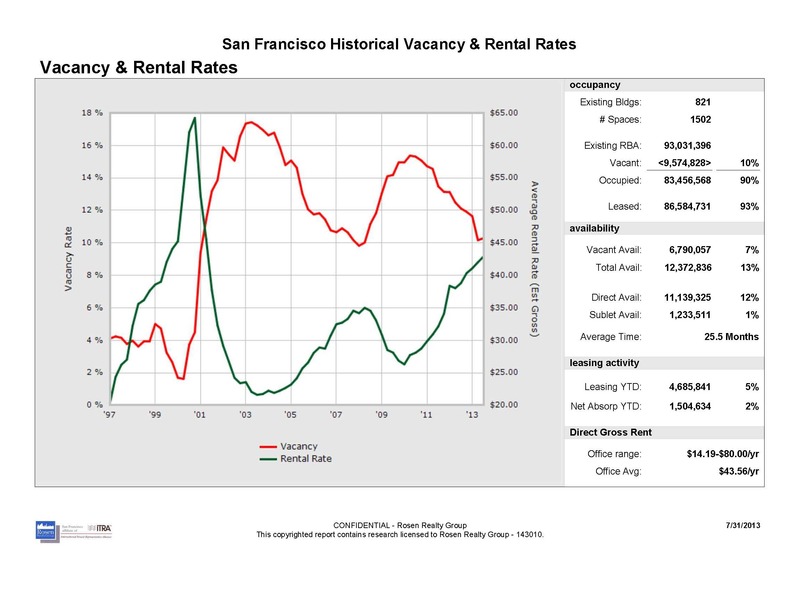 Vacancy rates still have room to fall to its historical 5% low range which (the data suggests) would move avg rental rates beyond $50 and maybe even $60 per sq ft rates. The 8 year CAGR (compounded annual growth rate) is a healthy 8%. There hasn’t been a significant decline in avg. rental rates since 2010 when avg. rates hit their low of $27.50. Over the last 3 yrs (36 months), avg SF rates have increased steadily to today’s $43.50 while vacancy rates are on a directly proportional decline from 15% to 10%. In terms of Silicon Valley/Pennisula, the data is similar: Vacant space has decreased for 9 quarters in a row to 10.2% vacancy rate as of Q2 2013; the lowest “available space” since the first quarter of 2001. What does this suggest for the next few years (2014-2016?). caveat: assumes mostly status quo with no major macro-economic surprise or downturn. These economic shocks can be seen from the graph (2001-2003 and again 2008-2010) and the impact of these economic shocks show a very predictable spike in vacancy and a dip in avg. rental rates. Bottom line: Commercial office space real estate demand is approaching a historical high and once again is beginning to outstrip supply. This is especially true for space of 50K sq feet and above which equates to workstation capacity of 300 employees +/-. Ok, I’ve heard from a few readers of this blog loud and clear. The “Live Like Dogs” and “What’s Your Walk Up Song” posts are cute but “Can you please get back to some good data and analysis”? The next few posts will be just that. Here goes. Zeno Group just published a great slideshare on VC Influencers including an analysis of the top VC’s social media consumption habits. They used Twitter stats, LinkedIn stats, and an online survey targeting the top 100 VC’s as published by the Forbes Midas List. 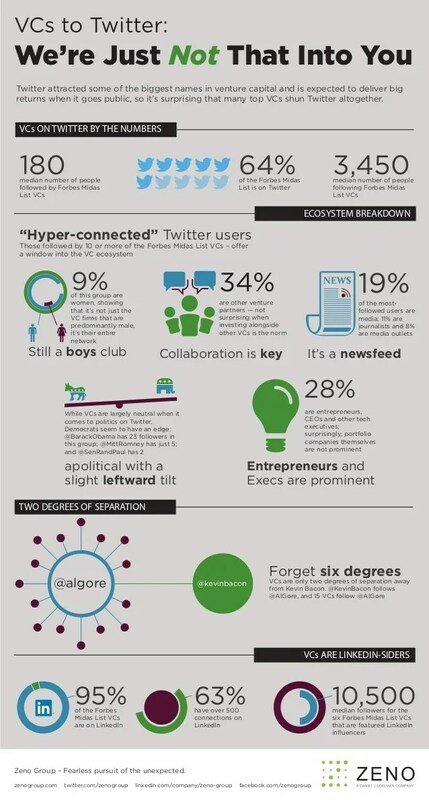 The results are a combination of unique and interesting data as well as confirmational data for anyone spending time following these folks on these social media networks or interacting with these VC’s and reporters as part of their jobs. I’m republishing the results on this blog mostly for my own convenience since I’ve noticed these types of published results quickly get lost in our ephemeral and quick twitch world of data coming at us. 37 of Top 100 VC’s have LESS than 500 Connections on LinkedIn. So, don’t feel so bad if you haven’t achieved this mark yet. You are currently viewing the archives for August, 2013 at Cook's Connections.